Archimedes was fascinated by curves. His powerful mind had mastered straight line shapes in both 2D and 3D. He needed something more intellectually challenging to test him. This came in the form of circles, ellipses, parabolas, hyperbolas, spheres, and cones. He rose to the challenge masterfully, becoming the first person to calculate and prove the formulas for the volume and the surface area of a sphere. The method he used is called the method of exhaustion, developed rigorously about a century earlier by one of Archimedes’ heroes, Eudoxus of Cnidus. The way Archimedes found his formulas is both amazingly clever and shows him to be a mathematician of the first rank, far ahead of others of his time, doing mathematics within touching distance of integral calculus 1800 years before it was invented. The surface of a sphere is incredibly hard to get to grips with compared with a shape like a cube. Cubes only change at the corners and edges. 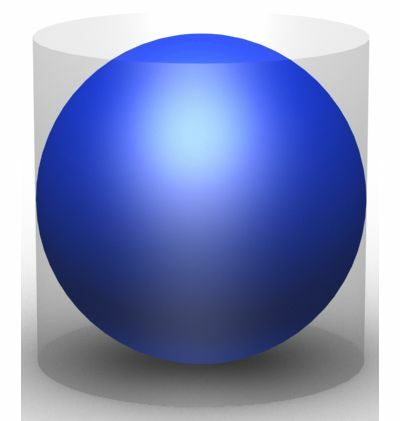 The surface of a sphere changes its direction at every point. How could you work with this? First, Archimedes imagined cutting a sphere into two halves – hemispheres. Taking one hemisphere gave him a shape with a flat surface to work with – easier than a sphere, and if he could find the volume of a hemisphere, doubling it would give him the volume of a sphere. He then imagined placing the hemisphere face down on a flat surface. Next, in his mind’s eye, he fitted a cylinder around his hemisphere. Archimedes then did something incredibly clever. Anyone who has studied university mathematics will recognize something rather similar to integral calculus. Archimedes imagined cutting horizontal slices through the cylinder. He took his first slice of mathematical salami at the very top of the cylinder. Here the hemisphere is at its smallest. Looking at this first slice from above, the radius of the circle from the very top of the hemisphere is infinitesimally small. Then, in his mind’s eye, he moved his attention a tiny bit lower down the cylinder and took another salami slice through the cylinder and hemisphere. In this slice, the hemisphere circle had grown a little larger. Then he moved his attention a little lower again, cutting another salami slice. 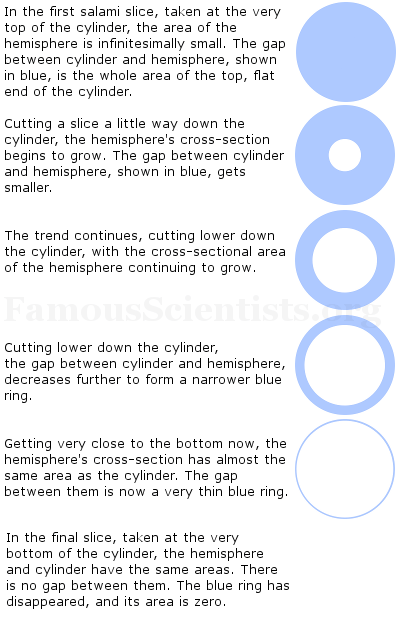 The cylinder circle stayed the same size, while the hemisphere circle was again a little larger than the previous slice. He then moved down the cylinder, taking slices all the way to the bottom. In each slice, the size of the inner circle got larger, while the size of the outside circle stayed the same, as shown in these images. The cross sections Archimedes imagined of the hemisphere and the cylinder. Archimedes considered each salami slice. In particular, he was interested in the gap between the two circles in each slice – shown in blue in the images above. Archimedes found that the volumes of the blue rings added up to the volume of a cone whose base radius and height were the same as the cylinder’s. This meant the volume of the hemisphere must be equal to the volume of the cylinder minus the volume of the cone. The formula for the volume of the cylinder was known to be πr2h and the formula for the volume of a cone was known to be 1⁄3πr2h. In this example, r and h are identical, so the volumes are πr3 and 1⁄3π r3. 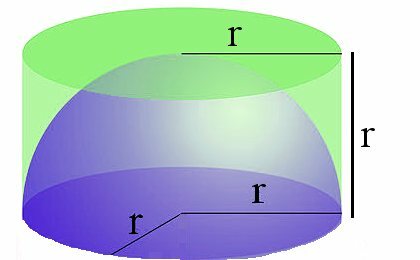 Archimedes also proved that the surface area of a sphere is 4πr2. Archimedes saw this proof as his greatest mathematical achievement, and gave instructions that it should be remembered on his gravestone as a sphere within a cylinder. The sphere within the cylinder. Image by André Karwath.